The Queensland government has decided to stamp out violence fuelled by drugs and alcohol using their Safe Night Out Strategy. 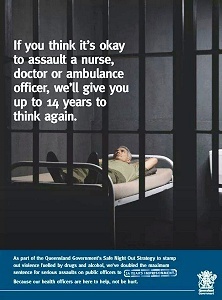 Under its law, the maximum sentence for serious assault on a nurse, doctor or ambulance officer is 14 years! This is just what India needs right now.